It's time for another double sketch over at Stick it Down! 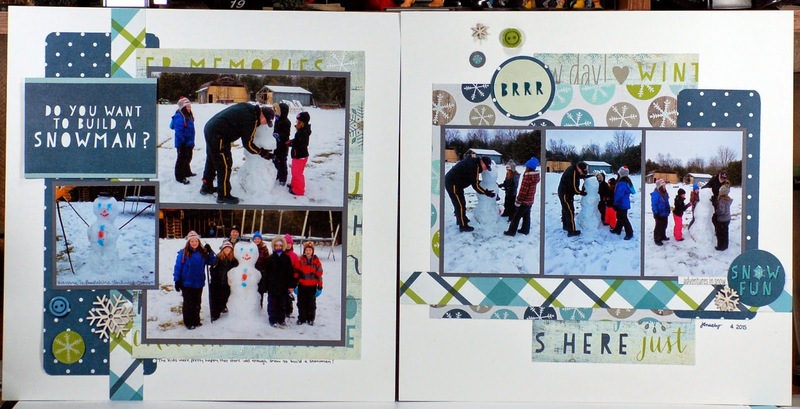 And my take on it featuring some pictures I love of my Dad and the grandkids making a snowman. Gotta find time to enjoy the little moments. Great pages! Love the patterned papers you used! Great Winter embellishments! Love love love love this!! LOVING the colors, the title and all the photos!!!!!! Wonderful photos and a terrific layout! what a great winter snow page!! LOVE the cute title too!!! great papers!!! Oh what a brilliant layout, great photos and love the papers. OMgosh this is so cute, love the layout and the fabulous design. Your papers are so perfect for this.